The Village of Thiensville is a small and primarily residential area that is completely surrounded by the City of MEQUON. The village is located along the Milwaukee River in OZAUKEE COUNTY, approximately nineteen miles northwest of downtown Milwaukee. Incorporated in 1910, the village occupies 1.1 square miles. Its estimated 2013 population was 3,235. German settlers began arriving in the area in the 1830s. The village is named after settler Joachim Heinrich (John Henry) Thien, who moved to the area in 1842 and helped design a plan for settlement. A year later he built a store and sawmill. In 1857 Thien established the volunteer fire department and served as its first captain. Like many German settlers in the area, he was a Free Thinker who belonged to the Benevolence of the National Organization of Free Thinkers Societies. The influence of the Free Thinker societies kept formal churches out of the village until 1919. Before churches arrived, local residents worshipped in their own homes. St. Cecilia Catholic Church held its first mass on November 23, 1919. The first Lutheran church was Grace Lutheran Church, which opened in 1929. The first school district that included the Thiensville area was the Van Buren School District No. 3, which was formed in 1844. A larger school was built in 1866 to accommodate the influx of immigrants. The Van Buren School building was vacated in 1924 because of the number of students. The Grand Avenue School was the last public school used within Thiensville; it was closed in the 1980s. In the twenty-first century, local children are educated in the Mequon-Thiensville School District. The Gilbert Shoe Company, which made children’s shoes, was Thiensville’s largest and only manufacturing employer in the twentieth century. In 1926, it occupied the Van Buren School building. The shoe company survived the stock market crash and the GREAT DEPRESSION of the 1930s. At its peak in the 1950s, it had 250 employees and made 1,800 pairs of shoes daily. As demand for their shoes decreased, the building became a warehouse in 1978. It was demolished in 2004. 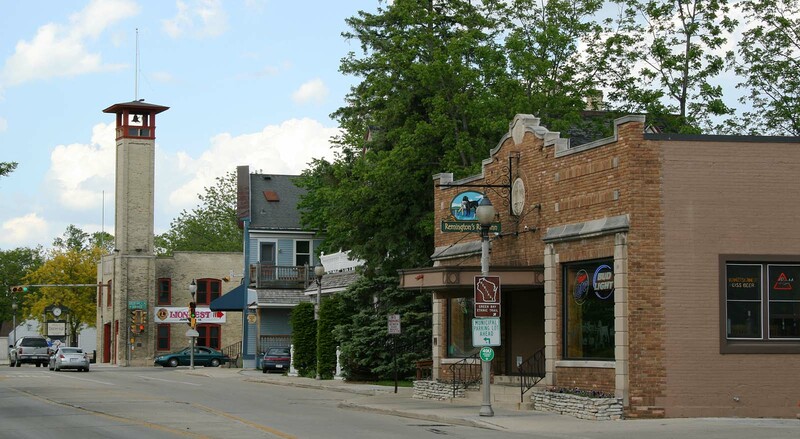 Thiensville’s history has been intertwined with the City of Mequon. The communities have grown closer through shared organizations, such as the school district and the Chamber of Commerce, and joint celebrations. The government of Thiensville is run by a Board of Trustees, which consists of six trustees and the village president. In 2010, the community had a median household income of $54,583 and a median home value of $219,900. The Village of Thiensville promotes itself as an attractive place for families to live and a great place to do business. In July 2005, Money magazine selected Thiensville (along with Mequon) as number nineteen on its list of the “100 Best Places to Live” in the United States. ^ Marie Anzia, History of Thiensville (Cedarburg, WI: New Graphics, 1976), 72. ^ U.S. Census, Thiensville, WI, 2010. ^ Walter Corrigan, Sr., History of the Town of Mequon (Cedarburg, WI: Cedarburg News Print, 1950), 17. ^ Anzia, History of Thiensville, 54. ^ Anzia, History of Thiensville, 15. ^ Anzia, History of Thiensville, 86. ^ Anzia, History of Thiensville, 92. ^ Anzia, History of Thiensville, 40. ^ Anzia, History of Thiensville,40. ^ Village of Thiensville Centennial Celebrates 100 Years, 79. ^ Village of Thiensville Centennial Celebrates 100 Years, 42. ^ Village of Thiensville Centennial Celebrates 100 Years, 9. ^ History of Thiensville Book Committee, Village of Thiensville Centennial, 132. ^ Village History, Theinsville website, last accessed July 29, 2017. Anzia, Marie. The History of Thiensville. Cedarburg, WI: New Graphics, 1976. Corrigan, Walter. The History of the Town of Mequon. Cedarburg, WI: Cedarburg News Print, 1950. History of Thiensville Book Committee. Village of Thiensville Centennial Celebrates 100 Years, 1910-2010. Milwaukee: Paragon Printing, 2010.